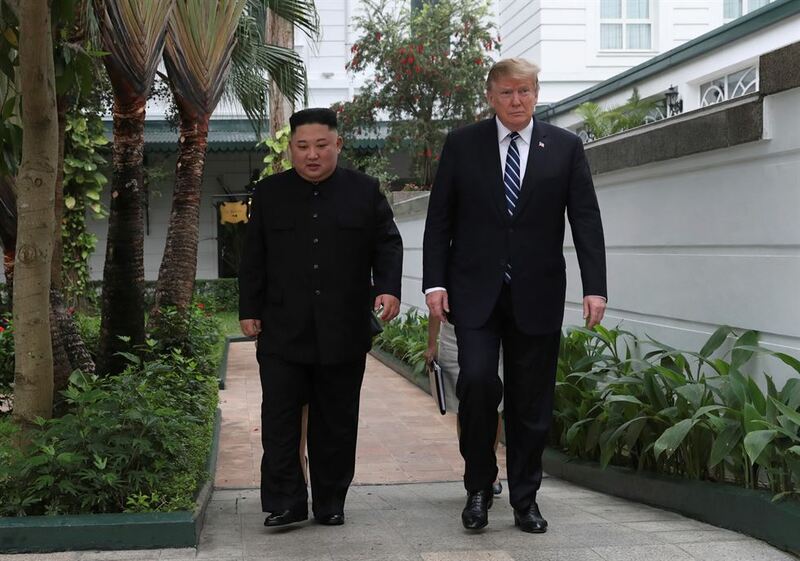 HANOI ― Despite broad pledges to denuclearize, talks aimed at dismantling North Korea's nuclear program saw further deadlock after no agreement was reached between U.S. President Donald Trump and North Korean leader Kim Jong-un at their second summit in Hanoi, Thursday. White House spokeswoman Sarah Huckabee Sanders said no agreement was reached "at this time," though the leaders discussed "various ways" to advance economic driven concepts and advance denuclearization. Trump and Kim had been scheduled to have lunch at the Metropole Hotel, downtown Hanoi, but didn't enter the dining room where reporters were assembled. "The decision was made at the very last minute. We have been forced to wait inside buses until further announcements," one journalist said. Early expectations were that both Trump and Kim would try to avoid overconfidence on future nuclear disarmament talks by taking a "phased and step-by-step approach." But political analysts and observers, here, said the talks face many tough hurdles. As nuclear weapons are considered the pillar supporting the North's political system and backing Kim Jong-un's support base, Trump is unlikely to be confident about Kim Jong-un's repeatedly expressed commitment to nuclear disarmament unless he is provided with concrete and verifiable evidence, they said. "One thing is that North Korea is getting closer to the prospect of dismantling its nuclear program. One objective for Trump is to let the media narrative develop their own stories on the issue," a journalist from the United States said. "The U.S. has the economic leverage now and should remain steadfast on demanding a permanent deal that requires North Korea abandon its nuclear weapons program and return to the treaty on non-proliferation (NPT)," said Lori Esposito Murray, an adjunct senior fellow at the Council on Foreign Relations, a U.S.-based think tank. The U.S. removed its nuclear weapons from South Korea in the 1990s. South Korea and North Korea's other regional neighbors are permanently bound by the NPT. North Korea is the outlier in the region. Before the start of the crucial final day of talks between Trump and Kim, the two exchanged goodwill gestures, raising hopes the meeting would produce visible results unlike the previous summit that produced vaguely worded promises. During a brief press conference ahead of the official meeting, Thursday afternoon, Kim said, "If I'm not willing to do that (dismantle the North's nuclear program), I wouldn't be here right now." After Kim's reply, Trump responded; "That's a good answer. Wow. That might be the best answer you've ever heard." Regarding the response, Kim didn't elaborate further as he requested the meeting proceed in private. Speaking to reporters at the start of the extended meeting at the hotel, Trump said he wasn't in a rush to "clinch a deal" with the North. "I've been saying very much from the beginning that speed is not that important to me. What is important is that we do the right deal. I'm sure over the years we'll be together a lot," Trump said alongside North Korean leader Kim Jong-un ahead of the summit. Sitting with Trump, Kim told reporters many people had been "skeptical" about the two leaders meeting. "I'm sure all of them will be watching the moment we are sitting together, side-by-side, as if they are watching a fantasy movie." Trump thanked Kim for his decision to end provocative actions since their Singapore meeting, as the North hasn't tested any nuclear weapons or missiles.